If there were a way for you to influence thousands for Christ around the world, and help alleviate the tragic suffering of hundreds in war torn third world countries, would you be interested? Opportunity is the key word! No fooling! God is using us to influence thousands for Christ! Here is what is happening…We thought you would want to know…and to join us if you have not already. 1. First, our website reaches up to 23,000 people every month from over 130 countries. Over 1,000 have enrolled in the online Bible Academy. Many come to the site from countries that are violently antagonistic to Christ. Christians can study the grand doctrines of Jesus Christ away from the prying eyes of hostile authorities. The tremendous benefits to people are the free Bible studies/courses, various articles about Christian life skills, issues and theology, books, a question and answer section…and much more. In the future, we want to put up weekly sermons and more videos. 2. Second, we lessen some of the desperate humanitarian needs of those in 3rd. world countries. Last year, for example, Esmie took a medical group to Palawan, Philippines. Many were taught basic health care, and several received Christ. Humanitarian work is second to our primary task of training and education – especially the education of pastors. Presently, we are limiting our focus to medical missions and the building of wells for the villagers. Even with the medical missions efforts, our focal point is on training in the area of public health. 3. Third, we travel to countries and teach modules on Bible subjects, and Christian life skills. We have taught pastor groups, in Bible Schools, and churches. Countries include Tonga, the Philippines, and Liberia. 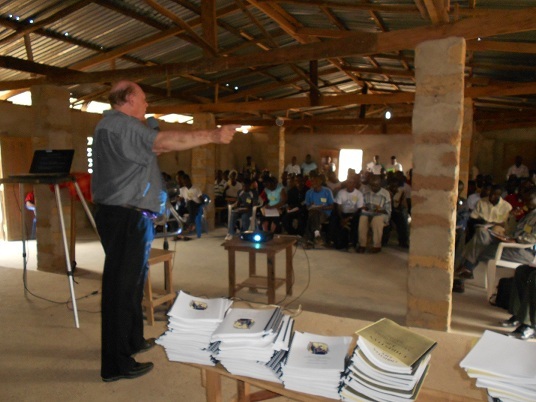 In March (2012), in cooperation with Village Ministries, we conducted a Pastors Development Conference in Liberia where over 750 pastors from some 280 churches attended. 4. Fourth, there is the literature ministry. Though the bulk of our teaching is through the internet, we distribute much training by study manuals. For example, at the Liberian pastor’s conference, we distributed over 1000 free study manuals to the pastors – many of whom did not even have Bibles. Pastors were standing in long lines to receive their free manuals – that is how needy and responsive they are for spiritual/Bible training. Also, in Liberia, our goal is to supply many Christian books along with college level text books and reference materials. We also have requests from other countries, for example, Kenya, to help them start a Bible Academy. In the rural areas, we need to supply the study materials. 5. The Liberian opportunity! What a whopper! That country is emerging from a bloody 14 civil war that devastated both social structures and the physical infrastructure. That is where the violent warlords with their African child soldiers ravaged and pillaged the country, and paid for their bullets with blood diamonds. We have partnered with a well respected and effective ministry in that country, Village Ministries, headed by Rev. Eric Sumo. With our Spirit filled, united efforts, we have an enormous opportunity to powerfully influence an entire nation for Christ … and even beyond to the neighborhood countries. Gross humanitarian needs lurk everywhere. Education and skills training are in frantic need. As God supplies, we will help Pastor Eric drill wells, provide medical aid, provide Christian literature, run his trade school for former Child soldiers, show the Jesus Film to villagers…and the list goes on. But, we cannot do it without your help!!! Here is the video report of Esmie's recent trip to Liberia where along with two friends, Audrey Melhuish and Dinah Tongco, taught 500 hundred women how to share their faith. They also led revival meetings at a church of 200. 6. The “Bible School in a Box” concept. For years, Esmie and I have envisioned a program where we could create a one or two year Bible School complete with forms and study manuals. As God gives opportunity, we would give it to pastors or mission groups, who would take it and run with it. They would need to organize the facilities, and administrate the school. Well, that is what we have done in Liberia with Village Ministries. After the Pastor’s Development Conference in 2012, the interest was so great for further quality Bible training, that the pastors urged us to start a Bible school! Consequently, Newman Bible Academy is now up and running in Liberia with some 150 pastors enrolled. Our commitment to that school is to provide some teachers from America, plus study manuals for each student. Village Ministries has organized the school, provided facilities, personnel, and the school is now in operation. The vast opportunity: thousands have been evangelized, but Bible training is lacking. Bible education is what we do. We are experienced, seasoned educators. We have been involved in overseas missionary Bible training for decades. We are a small organization with very limited resources, but face a mammoth opportunity far bigger than we ever dreamed. The task makes me gasp! For now, Esmie and I support ourselves. Frankly, we cannot begin to pay all the ministry bills. Actually, I would rather start taking it easy in my “golden” years. However, God has granted this enormous opportunity. As Christ’s servants, we will obey! We must. It will take thousands of dollars to provide the study manuals for those wonderful, grateful, eager pastors. Thousands more dollars could be used to alleviate the suffering of those fine, shell shocked, and spiritually wounded Liberians. On behalf of thousands of needy people around the world (and especially Liberia), will you commit to financially supporting this ministry? Some of you can give $500 or more per month (or a onetime gift), others can give perhaps $25 per month. Can you give your used books and Bibles? Others can pray and encourage. Remember, any items you give must be shipped and distributed – and that costs money. We ask that for every $70 worth of goods you donate, add an additional $30 for shipping and distribution costs. Could you “adopt a pastor/student” and pay for their Bible school expenses? Only $50 a term, or $150 per school year would provide for one pastor’s tuition and school supplies, with a little extra to support his family. Remember, you are not only training that pastor, but he will go back to his congregation and train those in his congregation – maybe fifty, or several hundred. In His power, we can do what God has put before us. Together, we can do this. Will you join and help us? We need faithful, steady supporters – just like you - who will answer God’s call. 1. Go to our website, (Bible-teaching-about.com), and using a PayPal account, click on the donate button. Just follow the instructions. 3. Contact us at our website (Bible-teaching-about.com). There we will keep you informed. If you wish to receive our prayer letter through the mail and/or email, contact us through our website, an email (drwillisnewman@gmail.com), or mail us at the above address.